Lanterns are a big part of the Mid-Autumn Festival and as always this time of year there are plenty of them to buy along Luong Nhu Hoc Street in Ho Chi Minh City’s District 5. Chinatown, as the district has been known for eons, has had a long love affair with lanterns, many of which can be seen above the lantern shops dotting the blazing street. Mrs. Ly Ngoc Hien and her husband have been selling them from the same premises for more than 10 years and like to reminisce about the early days of their business. "When we first arrived here, there were only a few shops which sold Chinese lamps. 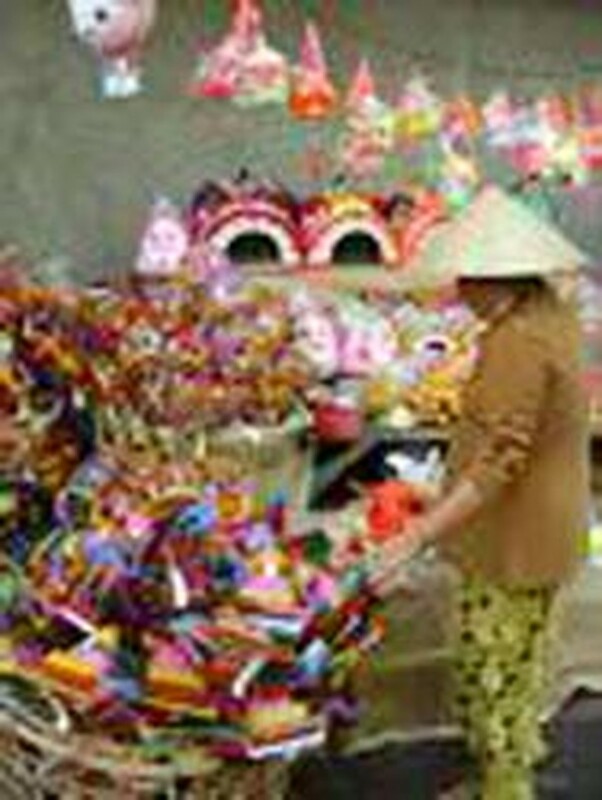 But as time went on more traders started selling lanterns both wholesale and retail, and even distributing them to the nearby provinces later on," Hien said. 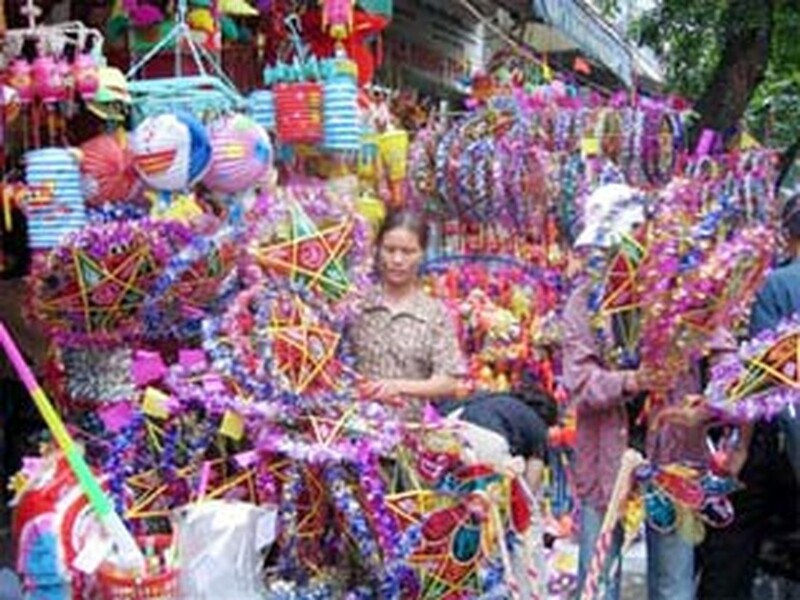 "The business is booming on this 200-meter street just like every time the Mid-autumn festival comes around," she added. Another retailer is Loi Vi Hung, a native of Can Tho in the Mekong Delta. Said Hung, "On the weekends, this street is packed with parents and their children at night. With so many people milling around looking for the spiritual value of the Mid-autumn Festival, the atmosphere is really exciting." A lantern seller displays her products on the street. In the old days lanterns were used to decorate the homes of the mandarins and wealthy merchants. When the eighth full moon of the year arrived, children would stroll along the streets with their brightly lit lamps in celebration of mid-autumn, when the moon was said to be at its fullest and brightest of the year. 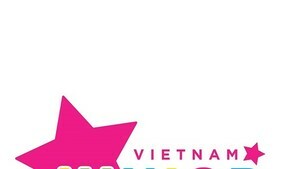 In most cases, a Vietnamese lantern has a bamboo frame covered with translucent or colored paper pasted on. The most sophisticated is the merry-go-round lantern, which is elaborately constructed so that when a candle is lit inside, the heat causes a delicate carousel of human and animal figures to move. The hand-made paper varieties are shaped like carp, butterflies, stars or boats. Each of these figures has its own legend, adding mysticism to the inherent beauty of the lanterns. "For example, a carp lantern conveys the legend of the carp that passed through the rain gate in a competition and transformed itself into a dragon. To parents, this shape is a symbol of the hope that their children will prevail over all challenges and be successful," another lantern seller explained. He then pointed out how, since 1999, mass-produced Chinese plastic lanterns with batteries were becoming more popular and affordable. "Parents like them because they feel they are safer than traditional paper lanterns lit with candles. Children prefer them because they are emblazoned with comic book heroes like Doraemon, Superman or the Japanese manga and anime characters like Pokemon and Pikachu," he said.